1. Sending Emails to Managers and Above? Recently I got a request to be able to send an email a sales rep's manager and their director when opportunities are closed as won. 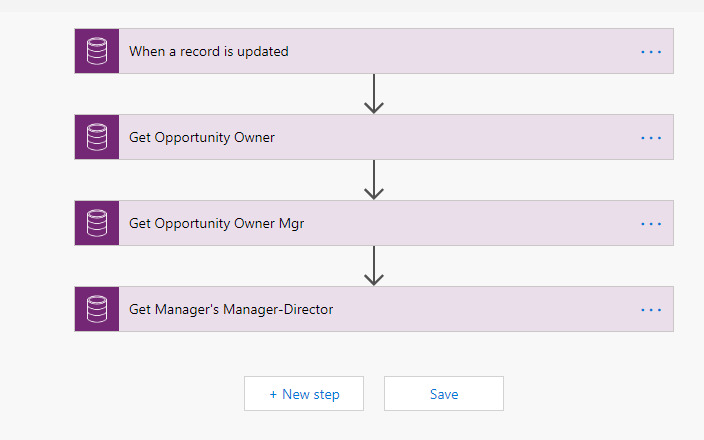 Setting up the email to send to the user's direct manager is simple using the related entity in the workflow (Owning User -> Manager), but having that same notification go to their director (Owning User -> Manager -> Manager) is not as straight forward. In our environment we have each member of the sales team assigned to specific positions and to a specific manager/director to create the hierarchy. So I need to be able to have a workflow look at the owning user, send a notification to their manager, look at that manager's manager/director and send the same email to them. I am thinking the easiest way to accomplish this would be to add another user lookup on the user record to directly capture their director. This way the workflow can easily grab the assigned manager and director to add to the email. This would create a little over head by adding a field that would need to be kept up to date as teams change. Using a workflow utilities solution we have installed I believe I can set up a workflow to help with this so the over head isn't too much. Before I started to create anything, I figured I would reach out to the community to see if anyone else has had a similar request and what they did to meet their needs. If possible I'd like to stick to an OOB solution versus using too much custom solutions. 2. RE: Sending Emails to Managers and Above? @Russ Morris - Have you looked at Microsoft Flow to accomplish this? I know this can be done very easily. See the below example snippet. Subject: Sending Emails to Managers and Above? 3. RE: Sending Emails to Managers and Above? @Aaron Back, MCSE - Thanks for the response. I actually haven't check into that yet. As far as I know we do not have any licensing for it or have it set up for our on prem deployment. We do plan on migrating online in the next few months so I can revisit it then. 4. RE: Sending Emails to Managers and Above? @Russ Morris if flow isn't an option, your approach is probably the best way. The only gotcha will be if the Manager's Director changes, after the user was created.​ To capture this change in the Sales Rep, you will need an update child records workflow. Demian Rasko's free Dynamics 365 Workflow Tools has an action for this. As you are on prem, and thus may be on an older version, you may have to dig up a previous release of his solution. If workflow tools isn't an option, you could run it all from the Opportunity. Add the Sales Manager lookup to the opp, and populate it when the opp is created. That way you can email the Sales Manager's Director. Tbh, this is probably the easiest way!